It poisons our water, contaminates our air and emits massive greenhouse gas pollution. Hydraulic fracturing, or fracking, involves blasting huge volumes of water mixed with toxic chemicals and sand deep into the earth to fracture rock formations and release oil and natural gas. This extreme form of energy production endangers our health and wildlands. A fracking boom can transform an area almost overnight, creating massive new environmental and social problems. Fracking development is intensifying in Pennsylvania, Texas and North Dakota and moving into new areas, like California and Nevada. Will your state be fracked next? But as fracking spreads across America, communities are fighting back — and the Center for Biological Diversity is working to ban this growing threat. A gift to the fossil fuel industry, the Energy and Natural Resources Act would advance the Trump administration's dirty-energy agenda. Take action now to stop this bill in its tracks. Photo courtesy Center for Biological Diversity. About 25 percent of fracking chemicals could cause cancer, scientists say. Others harm the skin or reproductive system. Evidence is mounting throughout the country that these chemicals — as well as methane released by fracking — are making their way into aquifers and drinking water. 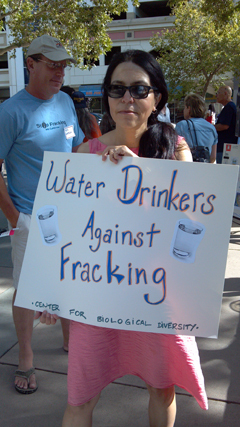 Fracking can release dangerous petroleum hydrocarbons, including benzene and xylene. It also increases ground-level ozone levels, raising people's risk of asthma and other respiratory illnesses. Wildlife is also in danger. Fish die when fracking fluid contaminates streams and rivers. Birds are poisoned by chemicals in wastewater ponds. And the intense industrial development accompanying fracking pushes imperiled animals out of wild areas they need to survive. In California, for example, more than 100 endangered and threatened species live in the counties where fracking is set to expand. Fracking releases large amounts of methane, a dangerously potent greenhouse gas. Fracked shale gas wells, for example, may have methane leakage rates as high as 7.9 percent, which would make such natural gas worse for the climate than coal. But fracking also threatens our climate in another way. To prevent catastrophic climate change, we must leave about 80 percent of proven fossil fuel reserves in the ground. Fracking takes us in the opposite direction, opening up vast new deposits of fossil fuels. If the fracking boom continues, oil and gas companies will light the fuse on a carbon bomb that will shatter efforts to avert climate chaos. To protect our environment from fracking, we must prohibit this inherently dangerous technique. That's why the Center supports fracking bans and moratoriums at the local, state and national levels.